Increasing numbers of regional climate change scenario assessments have become available for the North Sea. A critical review of the regional studies has helped identify robust changes, challenges, uncertainties and specific recommendations for future research. Coherent findings from the climate change impact studies reviewed in this chapter include overall increases in sea level and ocean temperature, a freshening of the North Sea, an increase in ocean acidification and a decrease in primary production. However, findings from multi-model ensembles show the amplitude and spatial pattern of the projected changes in sea level, temperature, salinity and primary production are not consistent among the various regional projections and remain uncertain. Different approaches are used to downscale global climate change impacts, each with advantages and disadvantages. Regardless of the downscaling method employed, the regional studies are ultimately affected by the forcing global climate models. Projecting regional climate change impacts on biogeochemistry and primary production is currently limited by a lack of consistent downscaling approaches for marine and terrestrial impacts. Substantial natural variability in the North Sea region from annual to multi-decadal time scales is a particular challenge for projecting regional climate change impacts. Natural variability dominates long-term trends in wind fields and strongly wind-influenced characteristics like local sea level, storm surges, surface waves, circulation and local transport pattern. Multi-decadal variations bias changes projected for 20- or 30-year time slices. Disentangling natural variations and regional climate change impacts is a remaining challenge for the North Sea and reliable predictions concerning strongly wind-influenced characteristics are impossible. This chapter addresses projected future changes in the North Sea marine system focussing on three major aspects, namely changes in sea level, changes in hydrography and circulation, and changes in lower trophic level dynamics, biogeochemistry and ocean acidification. Future changes in the North Sea marine system will be driven by a combination of changes induced by the globally forced oceanic boundary conditions and by regional atmospheric and terrestrial changes. Regional changes in sea level are forced by changes in ocean water mass, spatial changes in the Earth’s gravitational field, geological changes, changes in thermal and haline characteristics and the corresponding volume changes, and by the redistribution of water masses. Only the final two are accounted for directly or can be derived from General Circulation Models (GCMs, global climate models that are based on models for atmospheric and oceanic circulation). The first three contributions, which could have substantial impacts on regional sea level, must be estimated by a combination of expert judgement and additional methods and complementary models. In some cases, information from GCMs also plays a role and helps to ensure the development of an internally consistent scenario. Current GCMs and ESMs (Earth System Models, here used for global models) typically simulate changes in climate at a resolution of 100 km or more, and thus often fail to deliver reliable information on regional-scale circulation such as for the North Sea (e.g. Ådlandsvik and Bentsen 2007). Moreover, GCMs and ESMs are not optimised for shelf sea hydrodynamics and biogeochemistry, and some key processes relevant to North Sea dynamics, such as tides and physical and biogeochemical coupling at the sediment-water interface, are typically neglected. A systematic climate change assessment for the North Sea using GCM and ESM model data is therefore not available, except for climate change impacts on sea level (see Sect. 6.2). Detailed and spatially resolved studies of climate impacts on the North Sea system typically use dynamic downscaling approaches employing regional dynamic models. In a study of water level extremes, such as through storm surges, it is usually possible to make use of computationally inexpensive 2-dimensional barotropic models for water levels. A simplified approach is also possible for sea surface waves and a model of the generation and dissipation of wave energy is typically employed. However, for a detailed and spatially resolved investigation of regional climate change impacts on physical and biogeochemical variables a more complex and computationally expensive approach is needed. This requires high resolution 3-dimensional coupled physical-biogeochemical models with appropriate atmospheric forcing (i.e. air-sea fluxes of momentum, energy and matter, including the atmospheric deposition of nitrogen and carbon), terrestrial forcing (volume, carbon and nutrient flows from the catchment area) and data at North Atlantic and Baltic Sea lateral boundaries. The far-field oceanic changes in hydrography and circulation are almost exclusively projected using GCMs and their results from boundary conditions for regional North Sea studies. Oceanic boundary conditions from ESMs are used to project local changes in North Sea biogeochemistry. Dynamically consistent climate change scenarios for terrestrial drivers are still lacking, both at global and regional scales. Therefore, regional studies typically use a combination of forcing GCMs and ESMs, regional downscaling and impact models (see Annexes 2 and 3 for a general review of methods), and expert judgement based on available evidence for future impact scenarios for freshwater and nutrient fluxes from terrestrial sources. These regional studies typically employ a wide range of different methods to correct the regional bias in forcing GCMs or ESMs, which are necessary to ensure a correct seasonality and coupling of local ecosystem dynamics. In recent years, a range of regional scenarios have been published for the North Sea, addressing changes in sea level, hydrodynamics, productivity and biogeochemistry. The methods applied and processes considered vary greatly from study to study and could substantially affect the changes projected. Therefore, a classification of the most important methodological aspects used within the different subsections is provided and the projected impacts are discussed in relation to the study configuration where necessary. The Intergovernmental Panel on Climate Change (IPCC) concluded in its fifth assessment (AR5; IPCC 2013) that it is very likely that the mean rate of global averaged sea-level rise (SLR) was 1.7 mm year−1 between 1901 and 2010, and 3.2 mm year−1 between 1993 and 2010, with tide-gauge and satellite altimeter data consistent regarding the higher rate during the more recent period. While there has been a statistically significant acceleration in SLR since the start of the 20th century of around 0.009 mm year−2 (Church and White 2011), rates similar to that of the 1993–2010 period have been observed previously, for instance between 1920 and 1950. In the North Sea, rates of SLR for the 20th century of around 1.5 mm year−1 have been estimated (Wahl et al. 2013). Significant future changes in sea level around the world’s coastline are expected over the next century and beyond (IPCC 2013). As a global average, and depending on the choice of future greenhouse gas emission scenarios, SLR to 2081–2100 relative to the 1986–2005 baseline period ranges from 0.26 to 0.82 m. Numerous studies (e.g. Bosello et al. 2012; Hinkel et al. 2013) have highlighted the potential impacts in terms of flooding and loss of coastal wetlands, and the potential damage and adaptation costs. This section reviews recent findings on global and European sea-level changes, including the behaviour of storm surges, tides and waves. This sections addresses changes in the time-average sea level, leaving changes in rapidly varying components such as storm surge, tides and sea surface waves to later sections. The current view based on observations from the recent past and future projections by coupled GCMs is a long-term trend of rising sea level with natural variations superimposed on this general trend on a range of time scales and due to a number of physical drivers including atmospheric pressure and wind, and large-scale steric variations (Dangendorf et al. 2014). This variability obscures the detection of regional climate trends (Haigh et al. 2014) both in observations and scenario simulations. Variations in the time-average sea level can be driven by a number of processes. First, changes in density due to changing temperature and salinity are important for the sea level on a global and regional basis. Thermal expansion occurs as extra heat is added to the water column. Salinity changes in the water column are also important in some regions. In terms of the global average the thermal expansion effect dominates over the salinity effect on sea level. However, both can be important regionally (Lowe and Gregory 2006; Pardaens et al. 2011a). The other major process driving change in time-average sea level is change in total ocean water mass. Over the next century there is likely to be a transfer of water into the ocean from storage on land in mountain glaciers and the Greenland Ice Sheet, and possibly the West Antarctic Ice Sheet. Smaller contributions to sea level change may come from other terrestrial stores, both natural aquifers and man-made reservoirs—although this input is not expected to exceed the contribution from melting land ice. Geological changes, such as changes in the size of ocean basins can also alter global sea level. Variations in the spatial distribution of sea level are affected by several factors. From an oceanography perspective, changes in the density structure of the ocean and changes in circulation are likely to be associated with changes in the pattern of sea surface height as the ocean seeks to attain a new dynamic balance (e.g. Gregory et al. 2001; Lowe and Gregory 2006; Landerer et al. 2007; Bouttes et al. 2012). From the perspective of geology and solid earth physics, there are also spatial components associated with change in the Earth’s gravity field as water moves from storage in land ice into the ocean and movement of the solid Earth as the mass loading on both the land and ocean basins change (e.g. Milne and Mitrovica 1998; Mitrovica et al. 2001). The local and regional deviations from the global mean change can act in both positive and negative directions—in some cases adding to the global mean change and in others offsetting it. Future projections involving changes in water mass distribution must take account of these effects, typically by scaling the global mean change in water mass terms by an appropriate ‘fingerprint’ (e.g. Slangen et al. 2014). There is also an ongoing change due to the Glacial Isostatic Adjustment (GIA) associated with the last major deglaciation, although this is typically small in most locations compared to most business-as-usual projections for the 21st century. In the southern North Sea, vertical crust movements are negative and correspond to a future sea level increase. In the northern North Sea and along the Norwegian coastline vertical crust movement is positive and leads to a future decrease in sea level. The rate of GIA is roughly linear, with values between −1.5 and +1.5 mm year−1 (Shennan and Horton 2002; Shennan et al. 2009), although some higher values may be found (e.g. Simpson et al. 2014). Taking a wide range of physical effects into account the latest IPCC assessment highlighted that, based on the output of predictive models, around 70 % of the global coastline is expected to experience changes within 20 % of the global mean (IPCC 2013). There may also be land movement changes on a more local scale, for instance associated with subsidence caused by ground water or gas extraction. There are three main approaches to considering future global mean sea level changes in current regular use. The first is the use of complex spatially resolved physically based climate models, which attempt to simulate many of the major processes involved in changing sea level. A typical approach (e.g. Yin 2012) uses a GCM to simulate the large-scale evolution of climate over the next century for a range of alternative pathways of future greenhouse gas forcing. The GCM is able to simulate changes in heat uptake and so thermal expansion can be determined from changes in the in situ simulated ocean temperatures or even simulated directly. The simulated atmospheric temperature and precipitation changes can be used as input to separate physical models of glaciers (e.g. Marzeion et al. 2012; Giesen and Oerlemans 2013; Radić et al. 2014), the Greenland Ice Sheet (e.g. Graversen et al. 2011; Rae et al. 2012; Yoshimori and Abe-Ouchi 2012; Nick et al. 2013) and the Antarctic Ice Sheet (e.g. Vizcaíno et al. 2010; Huybrechts et al. 2011; Bindschadler et al. 2013) to estimate their contributions. The key advantage of this modelling approach is that it can address changes in the relative importance of many different physical processes involved. The disadvantage is that the models may not include all of the important physical processes in the coupled systems or may not represent them with sufficient credibility. This is demonstrated by the latest climate model validation tests (IPCC 2013), which show that although the models clearly have skill at representing many aspects of the real observable climate, other aspects differ sizeably between model and observations. In recent years a significant advance has been to close the global sea level budget (Church et al. 2011). As a result, improved estimates became available for the thermal oceanic contribution, for glaciers and land ice contributions and for terrestrial storage. This credible level of knowledge about the different contributions to SLR in the recent past means it is now possible to model these sufficiently well to make projections of future sea-level change. The second approach to projecting future global sea level uses climate models with reduced complexity. Here a model that represents the global average climate system is often used. A common approach is to solve the global average heat balance for the upper layer of the ocean, with radiative feedbacks supplying heat upwards from the surface and diffusion of heat downwards into deeper ocean layers (e.g. Raper et al. 2001). In complex models, many key quantities, such as climate sensitivity, are emergent properties. In reduced complexity climate models quantities such as climate sensitivity and mixed-layer depth are set as inputs and provide a means of tuning the simple climate models to emulate the global average behaviour of more complex models. Despite the tuning, there are limitations as to how well the simple model structure is able to achieve this (IPCC 2007). The major advantage of reduced complexity climate models is that they are computationally much less expensive than GCMs and so can be used to explore many more scenarios or to simulate much longer periods. The disadvantage is that they may not capture sufficient physics to be used outside their tuned range. Furthermore, most simple models only simulate long-term trends and do not capture interannual variability. Recent use has also involved combining the simpler models’ simulation of global mean values with a scaled spatial pattern of change in sea-surface height from the most complex GCMs (Perrette et al. 2013). This offers the ability to interpolate between the GCM results to generate additional scenarios, although these may be less reliable when addressing stabilised forcing cases. Extra care must be taken if this approach is used for extrapolation. The IPCC Fifth Assessment (AR5) provides the most comprehensive recent estimates of global SLR from physical models. Figure 6.1 summarises the likely range of 21st century projections. It is important to realise that these ranges are not derived purely from climate models. Expert judgement was used to broaden the range so that model estimates of the 90th percentile range were judged to correspond to the 66th percentile range in the real world. This range is wider than reported in IPCC Fourth Assessment (AR4) although direct comparisons must be undertaken with care, as emission or forcing scenarios, methodologies and even the components of sea level included are different (for emission scenarios see Annex 4). One key difference is that the most recent IPCC assessment (AR5) includes a component from changes in ice dynamics in the likely range of SLR, whereas the previous IPCC assessment (AR4) kept this separate. When this component is included in the AR4 likely range of SLR then for comparable emission or forcing scenarios the two assessments become more similar. A third class of modelling approach to estimate future global sea level is referred to as semi-empirical and typically uses a relationship derived from observations of sea level and either global temperature (e.g. Rahmstorf 2007) or radiative forcing (e.g. Jevrejeva et al. 2012). By combining the relationship with an estimate of future forcing or surface warming from either a reduced complexity model or a complex GCM, an estimate of future sea level can be made. There has been a long debate in the literature (e.g. Lowe and Greogry 2010; Rahmstorf 2010) about the validity of these models. The IPCC AR5 estimate prescribed low confidence in long-term projections from this method (IPCC 2013). However it should be noted that this class of models covers a range of techniques with some likely to be more physically credible than others. Typically semi-empirical methods simulate larger 21st century sea level responses than GCM-based approaches, although there is some recent evidence that ranges estimated from the different approaches are starting to converge (Moore et al. 2013). The range of semi-empirical model estimates in the IPCC AR5 is shown in Fig. 6.2. It is reasonable to ask if mitigation of emissions will impact significantly on the range of projected future sea level. Recent work has compared the climate response to business-as-usual scenarios, with increasing future emissions and aggressive emission reduction scenarios (Pardaens et al. 2011b; Schaeffer et al. 2012; Koerper et al. 2013). These studies show that mitigation this century (of a size to limit surface warming to no more than 2 °C relative to pre-industrial levels) likely will reduce SLR to 2100 by 25–50 % (Fig. 6.3). Due to the inertia of the climate system larger reductions are expected in the longer term, beyond 2100. However, eventually stabilisation of sea level may not be expected until several hundred years or more after stabilisation of atmospheric greenhouse gas concentrations or radiative forcing (Wigley 2005; Lowe et al. 2006; Levermann et al. 2013). This suggests that to avoid damaging coastal impacts may require both mitigation and adaptation approaches (Nicholls and Lowe 2004). It also raises the question as to whether SLR could be reversed artificially through geo-engineering. Studies such as that by Bouttes et al. (2013) show that the thermal expansion component of SLR can in theory be reversed but that the scenarios of atmospheric greenhouse concentration needed to achieve this are considered unlikely in the next century or so, and possibly even beyond. Land ice melt may be even harder to reverse on a practical time scale because it would take much longer for the ice sheets to recover, even if greenhouse gas concentrations were significantly reduced (Ridley et al. 2010), than the time needed to reverse thermal expansion. Another aspect of global mean sea level that has received attention from the adaptation community (e.g. Katsman et al. 2011; Ranger et al. 2013) is the possibility of an increase beyond the likely range projected by physically based climate models. Such a contribution could originate from additional dynamic ice sheet contributions, linked to the movement of fast ice streams and outlet glaciers. Numerous high-end SLR estimates exist (Nicholls et al. 2011) and while the physical processes involved are becoming better understood the global response is still poorly modelled. Several lines of evidence, such as paleoclimate (Rohling et al. 2008) and consideration of kinematic constraints on ice streams and glaciers (Pfeffer et al. 2008) along with recent consideration of instability of the West Antarctic Ice Sheet suggest it is prudent not to rule out such increases, although the largest increases are considered unlikely. The UK climate assessment in 2009 (UKCP091) (Lowe et al. 2009) concluded that 21st century global sea level increases of up to around 2 m could not be ruled out for design purpose of high risk developments, but clearly stated that rises of under 1 m are much more likely, even in higher emission scenarios. The IPCC AR5 concluded that several tens of centimetres of extra SLR could occur during the 21st century on top of the likely range due to instability of the West Antarctic Ice Sheet, but that other contributions were more unlikely or could not be quantified. When these high-end scenarios are considered, the projected SLR tends to be more similar to that of the semi-empirical method. However, this should not be considered validation of the latter approach because it is unlikely that it is able to capture the physics needed to produce the enhanced rise. Since the publication of the IPCC AR5, evidence has continued to accumulate on the behaviour of the ice sheets and their contribution to future SLR (e.g. Miles et al. 2013; Enderlin et al. 2014; Favier et al. 2014; Khan et al. 2014). This adds further evidence to there being low confidence in the AR5 estimates of the potential contribution of ice sheets to future changes in sea level. Numerous studies report the spatial deviation of regional sea level from the global mean values in GCMs (e.g. Gregory et al. 2001), with a considerable spread between models. Pardaens et al. (2011a) noted the lack of reduction in spread between the third and fourth IPCC assessments. Even the latest IPCC assessment (AR5) shows a wide range in the inter-model spread for regional sea level, although there is some convergence in major features, such as changes across the Antarctic Circumpolar Current and the variations associated with some of the large-scale ocean gyres. Moreover, it is now recognised that this is only part of the total pattern of sea-level response and that locally varying components from changes in land-ice loading must also be included and will further affect the spread (e.g. Simpson et al. 2014). Two pre-AR5 studies of the North Sea resulted in scenarios of future SLR. Lowe et al. (2009) presented a 5th to 95th percentile range based on IPCC AR4, with a number of regional adjustments. By including scenario uncertainty and model uncertainty they found an increase of 5–70 cm relative SLR for Edinburgh and 20–85 cm for the Thames Estuary, both reported for the period 1990–2100 and with the difference between the sites mainly due to different ongoing rates of vertical land movement. Katsman et al. (2008) estimated local increases for the North East Atlantic, for use by planners in the Netherlands. For the moderate climate scenario, they found projected ranges relative to 2005 of 15–25 cm in 2050 and 30–50 cm by 2100. For the warmer climate scenario the corresponding ranges were 20–35 cm in 2050 and 40–80 cm by 2100. In addition to maps of the spatial pattern of change, IPCC AR5 made available some site-specific estimates of future SLR. The time series of the nearest estimates, Ijmuiden in the Netherlands (which is inside the NOSCCA region of interest) and Brest in France (which is outside but near to the NOSCCA region of interest) are shown in Fig. 6.4. The local time-mean sea-level change values at the end of the 21st century shown in Fig. 6.4 are only slightly different from the global mean estimate for the same scenarios shown in Fig. 6.1. This is not surprising given the IPCC finding that around 70 % of the world’s coastline lies within 20 % of the global mean SLR. It also indicates that the global mean estimates for other emission or forcing scenarios can be applied to this European site. Consideration of the spatial patterns also suggests that to a first approximation this value can be applied to the North Sea region. Short-lived extreme water levels are often more relevant to many coastal impacts than the time-average changes. A low pressure weather system moving over the North Sea can produce an increase in water level through the inverted barometer effect, and through the winds driving water towards the coastline. The resulting storm surge shows variations on a time scale of a few hours and combines with the tidal water elevations. The highest water levels typically occur with a surge corresponding to the rising limb of the tide rather than the peak of the tide due to non-linear interactions between the tide and surge (Horsburgh and Wilson 2007). The surge is also not a static phenomenon and will move along the coastline as a trapped wave. Research into future changes in extreme water level uses a range of terminology and sea-surface height metrics, making such estimates difficult to compare. Some studies focus on changes in short-lived extreme water level above present-day mean sea level, while others consider changes in the meteorologically driven surge component only, sometimes expressed as a residual relative to the tidal level but increasingly expressed as changes in the skew surge. Furthermore, some studies refer to return periods while others frame their results as percentiles of the distribution of extreme levels. As the present assessment focuses on identifying the qualitative aspects of past research these complexities should not be a major hindrance. Changes in extreme coastal water levels can be driven by the time-average sea level changes, which raise the baseline onto which extreme events are added, or by changes in particular atmospheric conditions (e.g. Lowe et al. 2010). There is a strong indication that changes in extreme water levels around the globe during the instrumental record period (about the past 150 years) have been driven predominantly by changes in regional time-mean sea level (Menendez and Woodworth 2010). Similar findings have been published for the English Channel (Haigh et al. 2010). However, there is no way to know a priori whether this will hold in the future, or whether changes in meteorology will alter the characteristics of storm surges. Furthermore, Woodworth et al. (2007) noted a correlation between some aspects of extreme water levels, such as the winter extreme high water level around the UK measured relative to a fixed datum and the winter North Atlantic Oscillation index (NAO index, see Annex 1), a large-scale measure of the atmospheric circulation regime. The pattern of correlation was found to be very similar to that of the correlation of the time-mean water level and the NAO index, although the magnitude was stronger for the winter extreme high water level. As there is sufficient evidence that the changes in extreme water level due to changes in time-mean sea-level rise and changes in storminess combine approximately linearly (e.g. Kauker and Langenberg 2000; Lowe et al. 2001; Howard et al. 2010) over a sizeable range of future sea levels, it is insightful to consider the two components in isolation. The recent global analysis of Hunter et al. (2013) and extended in the IPCC AR5, examined change in the return period of extreme water level events for a fixed rise in time-mean sea level and a rise following a policy-relevant scenario. Focusing on the European region for a mean SLR of 50 cm, the frequency of extreme events measured relative to a fixed datum in the present day is projected to increase by around a factor of 10 at many sites in the southern North Sea, and by a factor of more than 100 at some points in the northern North Sea. Although the factors can be applied to a range of different return periods of events, this manner of presenting the results must be placed in perspective. The level of protection increase implied by these changes remains less than an 80 cm increase at most locations. In the EU-funded Ice2sea project (www.ice2sea.eu), Howard et al. (2014) considered how larger regional time-mean sea level increases from enhanced land ice melting might manifest in terms of changes in extreme sea level along the European coastline. Figure 6.5 shows that most of the projected 21st century change in North Sea extreme water levels is likely to come from the time-mean sea-level change. Considering a central ice melt estimate, Howard et al. (2014) found increases in the 50-year return period surge between about 20 and 40 cm. For a high-end scenario, increases in the 50-year return period surge were estimated at around 60 cm and 1 m. The estimated rise was biggest for Esbjerg and smallest for Bergen. For potential changes in storm surge heights resulting from future changes in meteorology, both modelling approaches (dynamical downscaling and statistical downscaling) are commonly used. It is clear that the large uncertainties about future storm activity in the North Sea (see Chap. 5) are also reflected in future changes in storm surge heights in the North Sea. A number of early studies looked at the differences between relatively short near present day and future time periods, typically using either barotropic models (Flather and Smith 1998; WASA-Group 1998; Langenberg et al. 1999; Lowe et al. 2001; STOWASUS-Group 2001) or statistical downscaling approaches (Langenberg et al. 1999). Some of these studies suggested significant changes might occur in various measures of extreme water level, although consistency between different studies was not large. Later studies continued to use the time-slice approach, but focused more on sources of uncertainty. For instance, Lowe and Gregory (2005) attempted to place the results in context by comparing the uncertainty in surge projections with those from other sources, such as uncertainty in mean sea level projections and uncertainty due to emissions scenario choice. Woth (2005) and Woth et al. (2006) analysed simulations for future North Sea storm surge levels for which the forcing data were derived from simulations of the global and regional climate using different global and regional models and the SRES scenarios A2 and B2 (see Annex 4). However, separating a robust climate signal from natural variability was still problematic. While use of time-slices was a pragmatic approach to the limits of computer power, which prevented long simulations of high resolution atmospheric models, it risks sampling long-period natural variability rather than picking up aspects of a long-term trend. Reanalysis of the 20th century storminess suggested the need for time-slices much longer than a few years or even a couple of decades. Most of the earlier studies also did not credibly estimate uncertainties in the results. Lowe et al. (2009) used an ensemble of 11 regional climate models to drive a North Sea storm surge model and investigate uncertainty as part of the UKCP09 study. All of the experiments were transient and began before present day and extended to 2100 to avoid the time-slice problem. Focusing on the southern end of the North Sea near the Thames Estuary they found that only one of the model simulations had a statistically significant increase in the height of the 50-year return period storm surge event. However, in physical terms this change of a few centimetres was small compared to the expected time-mean relative change in sea level. This result disagreed with many earlier studies but had the advantage of not needing to use time-slices. A recent reanalysis of the model results for sites outside the United Kingdom (Howard et al. 2014) suggested larger changes in the surge component at some locations, although for sea level extremes the effect of changes in time-mean SLR still typically dominated. Sterl et al. (2009) undertook a similar study using a global model ensemble and found a similar lack of a clear 21st century trend in the storm surge component, adding further weight to the projections from UKCP09. However, an important caveat is that the atmospheric model used for the UKCP09 ensemble was noted to have a particular storm track response; typically showing a southerly movement but with little evidence of an intensification of the storms. While this is one credible future response the possibility of an intensification of storms should not be completely ruled out, because some of the models used in IPCC assessments do show this (Lowe et al. 2009). A simple scaling argument suggested that if the ensemble of driving models had captured the largest increase in storm intensity from additional GCMs available it may have led to a bigger surge increase at some locations, comparable with changes in the future projected time-mean SLR. However, as such large changes in storm intensity were found in only one GCM (using the storm metric applied) the scaled results should be considered a low confidence projection (Lowe et al. 2009). Gaslikova et al. (2013) investigated a set of four transient regional projections for the North Sea for which the underlying simulations of the global climate includes combinations of one GCM, two initial states and SRES scenarios A1B and B1. Towards the end of the 21st century (2071–2100) they found an increase in extreme surge heights (mean annual 99th percentiles) in the south-eastern North Sea, which are highest in the German Bight by up to about 15 cm. The authors concluded that the increase in the 99th percentile surge height is mainly due to an increase in the frequency of storm events with intensities already occurring in the respective reference climate and that there are relatively few events with greater intensities. 50-year return values calculated from the 100-year long projection period (2001–2100) were compared to 50-year return values calculated from the 40-year long reference period (1961–2000) and resulted in an increase of between about 10 and 80 cm for the two locations examined off the coast of the German Bight (Fig. 6.6). These return values are comparable to those reported by Lowe and Gregory (2005). Gaslikova et al. (2013) also investigated internal climate variability in North Sea storm surge conditions and found multi-decadal variability within one projection as well as between the four transient projections, which is of the same order of magnitude as the increase towards 2100. Such multi-decadal variability was also found by Weidemann (2009), based on statistical downscaling of 17 projections for the SRES scenario A1B only differing by varying initial conditions. In this study the linear trend over the years 1958–2100 for the five study locations in the German Bight varied between −8 and 18 cm but most of the projections showed an increase in the surge height corrected for time-mean sea-level changes. The trends presented by Gaslikova et al. (2013) for the SRES A1B and B1 projections are within the range presented by Weidemann (2009). In a recent assessment of the Dutch coastline, KNMI (2014a, b) reported that changes in wind speed are small and that little change is projected over the next century in northerly winds, which are the ones that tend to cause the largest surges along this stretch of coastline. Extremes of water level are expected to continue to rise, however, driven by the rise in time-mean sea level. Taken together, the more recent studies suggest the possibility of either no significant increase or a relatively small increase in storm surge height in the North Sea. Where an increase is found it is typically largest at the southern end of the North Sea, especially in the south-east, with changes in the western and northern parts of the North Sea being smaller and non-uniform. It is also useful to consider possible future changes in the propagation of tides due to changes in time-mean sea level. This could be important from both a flood perspective and a consideration of renewable energy generation. The recent study by Pickering et al. (2012) suggests changes in the tides may result in the North Sea due to altered dynamics. They showed that a 2-m SLR would result in a ~ 5 cm increase in M2 tidal amplitude in the central North Sea and Southern Bight, and a similar decrease in between. An update by Pelling et al. (2013) highlighted a key remaining uncertainty in understanding this response—whether the water is assumed to be contained by a sea wall or allowed to flood the land. Recent work, based on seasonal variations in major tidal constituents (Gräwe et al. 2014; Müller et al. 2014) also suggests the need to consider changes in stratification on the continental shelf in shallow seas, which can alter the eddy viscosity and profile of currents with depth. See Sect. 6.3 for information on how North Sea stratification is projected to change. Future changes in waves can be simulated using wind information projected by GCMs and ESMs, sometimes atmospherically-downscaled over the primary region of interest. The studies then typically follow either the statistical approach or the dynamical approach, using models of the generation, transport and dissipation of sea-surface wave energy. Much of the progress in the Northeast Atlantic and the North Sea has used the dynamic wave modelling approach. Wolf and Woolf (2006) gave a useful overview of how particular aspects of changes in storminess generate changes in the wave climate in the North East Atlantic. The strength of the prevailing westerly winds and the frequency and intensity of storms, the location of storm tracks and the storm propagation speed were all considered. The strength of the westerly winds was found to be most effective at increasing mean and maximum monthly wave height. The frequency, intensity, track and speed of storms have little effect on mean wave height but intensity, track and speed did significantly affect maximum wave height. The earliest future projection studies, such as those by Rider et al. (1996) of the WASA-Group (1998), used highly idealised climate scenarios, took data from a single or very limited number of climate models and typically used time-slices that were short and did not adequately account for multi-decadal variability. Later studies began to improve their approach, using longer time-slices and modelling policy-relevant future scenarios. The STOWASUS-Group (2001) compared the 30-year time slices 1970–1999 and 2060–2089 for the IPCC scenario IS92a (see Annex 4). For a doubling of carbon dioxide (CO2) the wave climate responds to projected changes in wind forcing and the mean significant wave height (taken as the mean height of the highest third of waves) increases in the North Sea and north of the British Isles. However, the increase in the mean value throughout the entire year is no more than 15 cm. For extreme waves, expressed as higher percentiles of the distribution of significant wave heights the picture is a more mixed; for the 99th percentile there is an increase of around 0.25–0.5 m in the North Sea, however for the most extreme cases described by the 99th percentile there is little change projected for the North Sea. Debernard et al. (2002) analysed two 20-year time slices for 1980–2000 (reference climate) and 2030–2050 (near future climate). For the global simulations an emission scenario similar to IPCC IS92a was used. The authors reported that the changes in the wave climate for 2030–2050 were mostly small and insignificant. The next challenge was to try to sample uncertainty in the driving winds by using output from more than one GCM. Debernard and Røed (2008) analysed a set of four climate projections including combinations of SRES scenarios A2, B2, A1B, and three GCMs. The authors compared the results of the 30-year time slices for 1961–1990 (reference climate) and 2071–2100 (future climate) and found changes in the wave conditions for the four climate projections to vary in their spatial pattern and magnitude but that all agree in an increase of severe significant wave heights (99th percentiles) of 6–8 % along the North Sea east coast and in the Skagerrak. Grabemann and Weisse (2008) found comparable changes using a slightly different set of four climate projections, which incorporates two GCMs and SRES scenarios A2 and B2. Comparing the time slices 1961–1990 and 2071–2100 they estimated an increase in extreme wave height (99th percentile) in large parts of the southern and eastern North Sea of about 5–8 % (25–35 cm, average for the four projections). The greatest changes occur in the Skagerrak (an increase of up to 80 cm) in the ECHAM-driven projections. Changes in severe wave height towards the west and north of the North Sea are smaller or even negative. The increase in mean and 99th percentile significant wave height in the eastern North Sea is suggested to result mainly from an increase in the frequency of higher waves. This was also described by Groll et al. (2014). Both Debernard and Røed (2008) and Grabemann and Weisse (2008) reported that model-induced uncertainties and inter-GCM variability are larger than the scenario-related uncertainties (Fig. 6.7). Also Lowe et al. (2009) focused on model uncertainty and used three members of a 17-member GCM ensemble downscaled by a regional model over the North Sea to study future changes in wave heights. Some significant changes in the wave height were noted but further work is needed to understand the patterns. More focus is also needed on how to best select representative ensemble members of the driving GCMs from a larger model ensemble. Another aspect of uncertainty, the role of natural variability, has been addressed using an ‘initial condition ensemble’. De Winter et al. (2012) analysed a 17-member ensemble based on one GCM that was repeatedly started with 17 initial states for the SRES scenario A1B. Again the 30-year time slices 1961–1990 and 2071–2100 were compared. Mean wave heights and wave periods did not change, annual maximum conditions decreased in particular for wave periods and return periods showed no significant change in front of the Dutch coast. Furthermore, the authors found that annual maximum waves propagate more often to easterly directions, which is consistent with an increase in the frequency of extreme westerly winds. The importance of natural variability was investigated by Groll et al. (2014). They used transient projections (1961–2100) to evaluate the internal aspect of climate variability and found strong multi-decadal variability. The changes in median and severe (99th percentile) significant wave heights within a single projection and between projections are of the same order of magnitude as the change (increase in the eastern North Sea) towards the end of the 21st century. Owing to this strong internal variability the largest increase or decrease does not necessarily occur at the end of the 21st century but can occur earlier. Moreover, Groll et al. (2014) noted that the uncertainties from different GCM initial conditions, or arising from the use of different ensemble members are also important. In a comparative study of ten wave climate projections, including those by Grabemann and Weisse (2008) and Groll et al. (2014) a robust signal was found for the eastern parts of the North Sea where mean and severe wave heights in nine to ten projections tended to increase towards the end of the 21st century (2071–2100). The magnitude of this increase is much more uncertain. For the western parts of the North Sea a decrease is suggested in more than a half of the projections (Grabemann et al. 2015). These findings are in agreement with the results of other studies (e.g. Debernard and Røed 2008). The changes described are also consistent with a projected increase in the frequency of stronger winds from westerly directions. North Sea dynamics are controlled by the interplay of the seasonal heating cycle, atmospheric fluxes, tides, river inputs and exchanges with the open ocean. Most physical processes active in the North Sea are to some extent impacted by global change resulting from anthropogenic increases in greenhouse gas emissions. These impacts are, however, highly dependent on time and space scales and the dominant processes under consideration. The impact of climate change in shelf seas is essentially a boundary value problem, due to the shallow depth and short ocean memory relative to the timescale of climate change. Hence it is necessary to consider the external drivers in some detail. These naturally divide into three vectors: atmospheric, oceanic and terrestrial. A fourth important vector is variability in astronomical forcing (top of atmosphere radiation and tidal potential), but this is not a component of anthropogenic change and so not considered in IPCC assessments. However, it should be noted that changes in sea level and stratification will have some effect on local tidal amplitudes and the implications of this require further investigation (e.g. Pickering et al. 2012; Gräwe et al. 2014; see Sect. 6.2). Direct anthropogenic drivers may result as a consequence of climate change adaptation and mitigation measures. These are not specifically considered here, since human effects on the physical marine environment (e.g. arising from the installation of offshore renewable energy structures, mineral extraction, coastal protection measures etc.) tend to be local and/or coastal, and scenarios of anthropogenic drivers not related to climate change have yet to be developed for the North Sea region and integrated into regional future climate change assessments. To date, the focus of studies to assess potential climate change impacts on the North Sea dynamic system has been on shelf scales (> 10 km from the coast) and seasonal processes. Finer coastal scales and higher frequency processes remain for future work. The downscaling methods and scenarios used are diverse and so this section begins with a short overview of key approaches and methodology. The use of statistical downscaling (von Storch 1995, see Annexes 2 and 3), applied to assess climate change impacts on sea level, storm surges and wave climate (Sect. 6.2) and also frequently marine biota (e.g. Dippner and Ottersen 2001), is unusual for assessing climate change impacts on ocean dynamics and hydrography and all studies reviewed here were undertaken using the more complex and computationally more expensive dynamical downscaling method (see Annexes 2 and 3) using established and validated regional ocean models (ROMs). The first climate change downscaling studies for the North Sea were performed as research contributions, which focused on method development and provided first quantitative assessments of the potential regional impacts of future climate change (Kauker 1999; Kauker and von Storch 2000; Ådlandsvik 2008; Madsen 2009). These were followed by more comprehensive assessments performed as part of national regional climate change assessments such as the British UKCP09, the German KLIWAS2 (Auswirkungen des Klimawandels auf Wasserstraßen und Schifffahrt – Entwicklung von Anpassungsoptionen, German Federal Ministry of Transport, Building and Urban Development) and the EMTOX3 project from the Netherlands (Impacts of climate change effects on natural toxins in plant and seafood production, Dutch Ministry for Economic Affairs, Agriculture and Innovation). In parallel, a few larger European research projects such as the RECLAIM4 (REsolving CLimAtic IMpacts on fish stocks), ECODRIVE5 (Ecosystem Change in the North Sea: Processes, Drivers, Future Scenarios) or MEECE6 (Marine Ecosystem Evolution in a changing Climate) have produced a suite of regional downscaling studies. Most results are published as contributions to peer reviewed literature, but complementary and additional information is available in the form of project reports (e.g. Drinkwater et al. 2008, 2009; Alheit et al. 2012; Wakelin et al. 2012a; Bülow et al. 2014) or made available to the public via the internet (e.g. MEECE via www.meeceatlas.eu). A wide range of downscaling methods and models (see Table 6.1 for model acronyms) have been applied to assess regional climate change impacts and a best practice on regional marine downscaling is still a matter of research and consensus has so far not been established. The earliest dynamical downscaling exercise using the OPYC model (Kauker 1999; Kauker and von Storch 2000) was carried out well in advance of the IPCC AR4, and utilised GCM forcing from 5-year time slice experiments for a potential 2 × CO2 world. Most of the more recent regional projections were carried out for the end of the century (2070–2100) and utilise the SRES scenario A1B (see Annex 4). These experiments were performed either as time slice experiments of 20–30 years for present-day and future (end-of-the-century or middle-of-the-century) climates (Ådlandsvik 2008; Holt et al. 2010, 2012, 2014, 2016; Friocourt et al. 2012; Wakelin et al. 2012a; Pushpadas et al. 2015) or as continuous integrations (e.g. Mathis 2013; Gröger et al. 2013; Bülow et al. 2014; Mathis and Pohlmann 2014). Only one downscaling was performed for the SRES A2 scenario, which considers stronger radiative forcing (Madsen 2009). To date, only the regional ECOSMO model was used to project future changes based on the RCP4.5 scenario (see Annex 4) from IPCC AR5 (Wakelin et al. 2012a; Pushpadas et al. 2015). The downscaling setup and the methods applied for the scenario simulations were different with respect to downscaling chain, coupling of the atmosphere-ocean system, bias correction, consideration of terrestrial climate change impacts, open-ocean climate change impacts, Baltic Sea boundary conditions, and forcing GCM (see Tables 6.2, 6.3 and 6.4 for details). All regional models consider tidal forcing by the M2 partial tide, which is the major forcing tidal constituent in the North Sea. Most models also consider additional tidal constituents, but the actual tidal setup varies between the different models. To estimate uncertainties in projections of future climate the multi-model ensemble approach has been introduced in Earth system modelling of the North Sea region following the well-established strategy of IPCC assessments (e.g. Friocourt et al. 2012; Wakelin et al. 2012a; Bülow et al. 2014; Holt et al. 2014, 2016; Pushpadas et al. 2015). Both ensembles using one regional model with different global models (e.g. Wakelin et al. 2012a; Holt et al. 2014, 2016; Pushpadas et al. 2015) and ensemble downscaling from one GCM using different regional model systems are available for the North Sea (Bülow et al. 2014). The ensemble simulations allow for a first estimation of uncertainty arising from different GCMs and RCMs (regional climate models). However, it should be noted that the number of ensemble members is typically only two to three and so too small for a sound final assessment of uncertainty ranges. Complementary understanding of climate change impacts on the North Sea hydrodynamics and ecosystem dynamics is available from so-called ‘what-if’ or perturbation experiments that consider hypothetical ranges of forcing parameters. For these numerical experiments, forcing atmospheric boundary conditions (wind speed, air temperature, solar radiation) were separately perturbed by a change roughly of the order of the projected climate change (Schrum 2001; Skogen et al. 2011; Drinkwater et al. 2008) or defined by mixing present day with future forcing GCM variables (Holt et al. 2014, 2016). Such perturbation experiments are not dynamically consistent, but do provide some insight into the sensitivity of the regional system to climate change impacts and so improve process understanding. Despite huge differences in setup, forcing GCM, bias correction and time slice vs continuous simulations, the future projections for sea-surface temperature (SST) in the North Sea are consistent in sign for the different regional model setups, however there are differences in the magnitude of change. Projected annual mean SST increases for the end of the century are in the range 1–3 °C for the A1B scenario (exact numbers are not given here due to differences in spatial averaging and reference periods from the existing literature). Within the given range, projected temperature changes are consistent for the different regional models used. Projected temperature changes are found to be statistically significant using the Kruskal-Wallis test (Wakelin et al. 2012a) or other measures such as the standard deviation (Ådlandsvik 2008; Mathis 2013) so far investigated. Projected changes in SST are typically more pronounced than changes in depth-averaged (or volume-averaged) temperature, which is the ecologically more relevant parameter since it affects vital rates in organisms that are distributed through the entire water column, and are almost completely driven by changes in atmospheric boundary conditions and air-sea fluxes (e.g. Ådlandsvik 2008; Wakelin et al. 2012a). A few studies were performed using the same GCM forcing but different regional ocean models and configurations. These use the IPSL-CM4.0 ESM (Wakelin et al. 2012a; Chust et al. 2014; Holt et al. 2014, 2016) and MPIOM (Mathis 2013; Gröger et al. 2013) as global forcing. The resulting changes in SST from these experiments are typically very similar for different regional ocean models and differ only by around a tenth of a degree. On the other hand, ensemble studies performed with one regional ocean model and different forcing GCMs clearly show that the magnitude of the projected changes significantly depend on the forcing GCM (Wakelin et al. 2012a; Holt et al. 2010, 2012, 2014, 2016; Pushpadas et al. 2015; Fig. 6.8). Regional projections using different versions of the Max Planck Institute GCM (ECHAM5/MPIOM) and the Norwegian climate models (BCM and NORESM) are typically at the lower end (Kauker 1999; Wakelin et al. 2012a; Gröger et al. 2013; Mathis 2013; Pushpadas et al. 2015). Stronger warming was projected from simulations using the Hadley-Centre climate model (Holt et al. 2010, 2014, 2016; for the SRES A2 scenario Madsen 2009) and the largest changes were projected when using boundary and initial conditions from the French climate model IPSL-CM4.0 (Wakelin et al. 2012a; Holt et al. 2010, 2012, 2014, 2016; Pushpadas et al. 2015); a GCM that projects stronger warming also on the global scale (e.g. Kharin et al. 2007). Most of the previously reported downscalings were based on uncoupled ocean downscaling neglecting local atmosphere-ocean feedbacks at the regional scale, which were earlier identified to be potentially important for the North Sea region in a present-day hindcast scenario (Schrum et al. 2003a). To account for these regional air-sea feedbacks, a first multi-model ensemble with coupled atmosphere-ocean regional models (AO regional models) was performed as part of the German climate change impact project KLIWAS (Bülow et al. 2014). Three different coupled regional AO models were developed, namely MPIOM-REMO (Sein et al. 2015), HAMSOM-REMO (Su et al. 2014) and RCA-NEMO (Dieterich et al. 2013; Wang et al. 2015). The three models have in common that the atmosphere components are all limited area models while their ocean components differ focusing either on the North Sea (HAMSOM), the North and Baltic seas (NEMO) or the global ocean employing a regional zoom to the North Sea (MPIOM-zoom). An ensemble of transient simulations 1960–2100 from all three models driven by the same GCM (ECHAM5-MPIOM) was performed for the SRES A1B scenario (Bülow et al. 2014). All models show an area-averaged monthly mean SST increase of 1.7–3.0 °C for the end of the century (Fig. 6.9) and annually average SST increases of about 2 °C (Bülow et al. 2014), which is very similar to uncoupled downscalings forced by the ECHAM5/MPIOM model reported by Wakelin et al. (2012a), Mathis (2013) and Mathis and Pohlmann (2014). However, the uncertainty range arising from the different regional models was significantly larger compared to uncoupled model simulations. An approximately linear trend of about 2 °C per 100 years was projected for SST through continuous simulations (e.g. Mathis 2013: 1.67–1.86 °C). The ensemble projections for the middle of the century were consistent with this trend. When forced by the ECHAM5/MPIOM a change of 0.4–0.8 °C was derived for the near future (2031–2050, Friocourt et al. 2012) and about 0.6–1.3 °C in the coupled simulations (Bülow et al. 2014). The spatial patterns of the projected warming were consistent with time-slice end-of-century projections and increased warming was projected for the coastal zone compared to the northern North Sea. The multi-model ensemble for the near future (+65 years) performed with ROMS, forced by the GISS, BCM, and CCSM GCMs (Alheit et al. 2012; Fig. 6.10), supports the view that the choice of forcing GCM contributes substantial uncertainty to the magnitude of projected warming. The GISS-based downscaling, which has the largest warm bias in the control run, simulates a weak warming. Annual average temperature is rising by 0.3 °C at 25 m in the future scenarios. The BCM downscaling shows an average warming of 0.6 °C. The downscaling based on NCAR CCSM, which has a cold bias in the control simulation, gives the strongest warming at 1.1 °C on average. Simulated future temperature changes are generally seasonally dependent. Many models project larger changes in SST during summer months when a shallow thermocline restricts the incoming heat input to the sea surface (e.g. Figure 6.8) compared to winter, when the North Sea is well mixed and incoming heat is distributed over the entire water column, despite larger changes in heat flux during autumn and winter (e.g. Holt et al. 2010, 2012, 2014). Due to well-mixed conditions during winter, heat flux anomalies result in a larger temperature increase in the shallow south-eastern North Sea than the deeper central and north-western North Sea (e.g. Holt et al. 2010, 2012; Wakelin et al. 2012a; Fig. 6.8). During stratified summer conditions, the southern North Sea also warms more strongly, since mixed-layer thickness is typically shallower than in the northern North Sea (Janssen et al. 1999; Schrum et al. 2003b). However, these regional and seasonal variations in warming are not consistent among the different regional model realisations. Exceptions are those simulated with the HAMSOM model (Mathis 2013), the NORWECOM (Friocourt et al. 2012), and the coupled models (Bülow et al. 2014). These project larger temperature changes in winter, autumn and spring, with significant inter-model differences. From the multi-model ensembles it seems that the strength of the coupling and hence the regional and seasonal pattern of projected changes, are significantly affected by the properties and parameterisations of the regional model. Likely candidates are mixed-layer depth, flux parameterisations and local feedbacks. However, the attribution of a definite cause for the inter-model deviations is not obvious from existing literature. The ECOSMO model has also been used with forcing from the IPCC AR5 generation models to simulate the RCP4.5 scenario; the first and so far only published attempts to employ the new updated IPCC AR5-scenarios for the North Sea (Wakelin et al. 2012a; Pushpadas et al. 2015). When comparing the simulation to the older SRES A1B scenario simulations, slightly less warming was found for the simulations forced by the RCP4.5 scenarios and IPCC AR5 generation models (Wakelin et al. 2012a; Pushpadas et al. 2015; Fig. 6.11), which could be largely explained by the fact that both story lines are not fully comparable and the RCP4.5 scenario provides less radiative forcing (see Annex 4). A slight reduction in the ranges of projected SST change was also evident (Pushpadas et al. 2015). North Sea salinity is influenced by the local balance between precipitation and evaporation, terrestrial runoff and exchange with the North Atlantic and the Baltic Sea. The regional projections of salinity considered in this section utilise full hydrodynamic models. However, their predictive capacity for salt and fresh-water changes is limited and results are biased to an unknown degree by the assumptions and approaches chosen for considering terrestrial fresh-water fluxes (e.g. Wakelin et al. 2012a), Baltic Sea water fluxes (e.g. Mathis 2013), Atlantic boundary conditions (e.g. Friocourt et al. 2012) or the use of a relaxation scheme (e.g. Ådlandsvik 2008), together with the accuracy of cross-shelf circulation and mixing. An attempt to consider all climate change impacts on fresh and salt water sources consistently has only been made for a few studies (e.g. Gröger et al. 2013; Bülow et al. 2014). However, these studies required different global bias- or fresh-water flux corrections in the global forcing model to avoid drift in salinity (see Tables 6.1 and 6.2 for details) and their projections differ despite using the same GCM, possibly due to a regional sensitivity to bias or flux corrections in the GCM. Gröger et al. (2013) projected substantial freshening of the North Sea manifesting in a reduction in surface salinity of 0.75 (Fig. 6.12), which is coherent with a stronger hydrological cycle and substantial freshening of the North Atlantic under future warming modelled at the global scale. The simulated freshening peaks around 2060–2070, with salinity then increasing towards the end of the century but not to present-day values. A similar freshening of the North Sea is apparent in the HAMSOM regional projections based on the same coarse resolution GCM forcing (Mathis 2013; Mathis and Pohlmann 2014), despite no terrestrial runoff change considered here. In contrast, results from coupled atmosphere-ocean downscaling presented by Bülow et al. (2014), which also used A1B and ECHAM5-MPIOM forcing but with higher resolution, projected salinity to decrease by only about 0.2 (Bülow et al. 2014; Fig. 6.13). This suggests that the projected salinity change is strongly sensitive to the resolution of the atmospheric and oceanic modelling component used and the bias correction or restoring methods used in the global model. Moreover, biases in the flux coupling and internal variability contribute to local deviations and inter-model variability in projected changes. The other regionally coupled AO-projections from NEMO and HAMSOM, which use forcing from the same GCM (but different global realisations, details given by Bülow et al. 2014), project decreases in salinity of the same order of magnitude. However, inter-model differences stemming from the regional models or global runs used are above 0.2 in salinity and significant differences in spatial pattern occur (Fig. 6.14). The differences are particularly strong for the Baltic Sea outflow and the northern boundary inflow. The projected overall freshening of the North Sea is confirmed by most of the other regional downscaled scenarios (e.g. Kauker 1999; Holt et al. 2010, 2012; Wakelin et al. 2012a; Pushpadas et al. 2015), but the strength of the salinity decrease appeared to be strongly dependent on the choice of GCM (Holt et al. 2014, 2016; Wakelin et al. 2012a; Pushpadas et al. 2015; Fig. 6.15) and inter-GCM related variability in projected surface salinity change is large (≈ O(0.5–1)) and increases from AR4- to AR5-based regional downscaling (Pushpadas et al. 2015). The regional model and assumptions made for runoff and Baltic Sea exchange contribute to inter-model variability. However, these are second order effects compared to GCM-related variability, and projected salinity changes are largely related to North Atlantic salinity changes and the wind-driven inflow to the North Sea. This is confirmed by near future projections: Friocourt et al. (2012) attributed modelled near-future freshening of the North Sea partly to decreasing winter inflow. Potential impacts of circulation changes on salinity were earlier studied by Schrum (2001) in a simple perturbation experiment, which revealed that decreasing westerly wind speed by 25 % would result in a basin-wide freshening of the North Sea of the order of a 0.3–0.4 reduction in average salinity. During winter the North Sea is generally well mixed due to surface cooling and resulting thermal convection, and winter surface temperature generally describes the average temperature of the water column. In late spring, a seasonal thermocline develops (Janssen et al. 1999; Schrum et al. 2003b) and the well-mixed surface layer decouples from the lower layer water. The timing and duration of stratification, thermocline strength and the thickness of the surface mixed layer have implications for air-sea fluxes. Changes in stratification also affect regional ocean characteristics, for example the seasonal variations in tidal constituents through changes in eddy viscosity and current profiles (Sect. 6.2) and sediment transport (Gräwe et al. 2014). Stratification is also an important control of nutrient supply to the euphotic zone and changes in stratification are therefore a major driver for changes in primary production (e.g. Holt et al. 2014; Sect. 6.4). A measure of stratification that can be applied to both the shallow shelf and the open ocean is the potential energy anomaly (PEA). This is here defined as the energy required to mix the water column over the top 400 m (see Holt et al. 2010 for further details). For the North Sea, PEA is at minimum in winter, when the water column is well mixed, and increases as soon as seasonal thermal stratification develops. Coastal areas and the Southern Bight are well mixed all year round by intense tidal mixing and show minimal values for PEA throughout the year, as illustrated by the POLCOMS control experiment (Fig. 6.16). The POLCOMS scenario experiments project a substantial increase in stratification in open-ocean regions (e.g. Holt et al. 2010), which is consistent with a future shallowing of the open-ocean mixed layer as modelled by Gröger et al. (2013) and seen in most GCMs (e.g. Allen and Ingram 2002; Wentz et al. 2007). Projections suggest the shelf will remain generally well mixed during winter, but that stratification in spring, summer and autumn will increase significantly, which could be attributed to earlier onset and later breakdown of seasonal stratification (Holt et al. 2010, stratification is here defined as a sustained surface to bottom density difference equivalent to 0.5 °C and a mixed layer shallower than 50 m) and to stronger stratification during summer. Using the POLCOMS-HadRM3-HadCM3 model scenario, Holt et al. (2010) found that stratification would start 5 days earlier and breakdown 5–10 days later by the end of the century (Fig. 6.17). During summer the greatest increase in ocean stratification is to the south of the domain. Ensemble simulations using different GCMs (POLCOMS-based) are shown in Fig. 6.18 (note the graphic shows fractional changes). All ensemble members simulate a positive fractional change almost everywhere throughout the season. The increase in PEA is strongest in winter in the open ocean and lower in summer and on the shelf. The ensemble simulations also indicate substantial inter-model variability in projected changes in stratification during summer on-shelf and at the shelf break and in the open ocean throughout the year. While there is also a significant fractional change in ‘well-mixed’ regions, absolute values remain low. Potential energy anomaly is a metric that does not inform about vertical structure and strength of gradients. Higher PEA could correspond to a deeper thermocline or to a stronger vertical gradient without a change in thermocline depth. Alternative metrics are the depth and strength of the thermocline, which could also provide insight into the nature of the change. Using these metrics Mathis (2013) and Mathis and Pohlmann (2014) identified a weak shallowing of the thermocline in the HAMSOM projection, which they attributed to a weakening of summer wind speeds. In contrast, the seasonal maximum thermocline depth showed a clear and strong deepening trend. Mathis and Pohlmann (2014) attributed this to a delay in thermocline erosion south of the 50 m depth contour in autumn, caused by a decrease in seasonal heat loss and wind speeds in the future (Fig. 6.19). The spatial extent of stratification is mainly determined by local bathymetry and tidal amplitude and so is not subject to significant change (e.g. Mathis and Pohlmann 2014). Mean and maximum thermocline strength are both decreasing, due to stronger warming in winter compared to summer in the HAMSOM projection. Since the temperature of the deeper waters is largely determined by the water temperature of the preceding winter, this results in a progressively smaller temperature difference between surface and bottom waters under a future climate. This conclusion from the HAMSOM simulations is in contradiction to results from Gröger et al. (2013) who found an increasing salinity difference between surface and bottom water and speculated that this is due to enhanced river runoff and a strengthening hydrological cycle through the 21st century. This discrepancy might be explained by different consideration of runoff changes in both downscalings. In contrast to MPIOM simulations, which resolve and consider runoff changes, the HAMSOM-based downscaling experiment is forced by constant climatological river runoff data based on values for the latter half of the 20th century over the entire simulation period. Another reason might be the different downscaling procedures applied, namely bias corrections for HAMSOM downscaling and direct forcing with salinity restoring to the forcing coarse-scale GCM in the coupled atmosphere-ocean model, which have the potential to modulate regional climate change impacts. A detailed investigation of transport change was undertaken by Mathis (2013) and Mathis and Pohlmann (2014) based on one regional scenario only. Projected future changes in circulation were analysed for seasonal mean current velocity vectors and trend analyses were applied to depth-averaged current speeds and to volume transports through various lateral sections in the North Sea. Mathis and Pohlmann identified an enhanced general circulation and a stronger northern inflow (Fig. 6.20) in spring, caused by stronger westerly and north westerly winds in the forcing GCM. For the other seasons the slightly decreasing mean wind speeds result in a slightly weaker general circulation. They identified increasing northern inflow in spring (by about +21 %, +0.134 Sv; 1 Sv = 1 million cubic metres per second) as the most significant seasonal 100-year change, which also dominates on annual scales. The other important change is a substantial decreasing inflow through Dover Strait in summer (−38 % or −0.023 Sv). In addition, they found a 12 % (−0.113 Sv) weakening of the Skagerrak recirculation in autumn and a 10 % (−0.055 Sv) reduction of the inflow through the Fair-Isle Passage in winter. A substantial proportion of the northern inflow reverses into the Norwegian Coastal Current shortly after entering the northern North Sea, which consequently increases. Due to a weaker Dooley Current, caused by reduced Fair-Isle inflow, the northern inflow is guided south-eastwards to a lesser extent so that more water of North Atlantic origin is able to enter the central and southern North Sea. A westward strengthening of the northern inflow is indicated through increasing current speed east of the Shetland Islands and in the central North Sea. The changes in depth-averaged current speeds across the entire northern North Sea are statistically significant, as indicated by confidence levels higher than 95 %. Detailed studies of transport pattern are not available from other regional scenarios and so it remains open how large internal variability and inter-model uncertainty is and whether the projected changes can be considered as robust. However, an overall increasing inflow was also projected by ROMS forced by the global climate model BCM (Ådlandsvik 2008). In contrast to Mathis (2013) and Mathis and Pohlmann (2014), Ådlandsvik projected an increasing inflow for almost the entire seasonal cycle. Only the October and November inflows were projected to decrease slightly. Using a different setup (ECHAM3-RACOM-NORWECOM), Friocourt et al. (2012) simulated for the near future (2031–2050) a decrease in inflow into the North Sea of about 5 %, for almost the entire seasonal cycle (exceptions August and November) with the NORWECOM model. Climate change impacts on primary production and responsible biogeochemical changes and ocean acidification were studied in a sub-set of the downscaling experiments summarised in Tables 6.2 and 6.4. The POLCOMS, ECOSMO, HAMSOM, Delft3D, NORWECOM and MPIOM simulations were equipped with a lower trophic level model (Alheit et al. 2012; Holt et al. 2012, 2014, 2016; Wakelin et al. 2012a; Gröger et al. 2013; Chust et al. 2014; Skogen et al. 2014; Pushpadas et al. 2015). Some of these downscaling scenarios also considered carbonate chemistry, but published estimates of future ocean acidification are available only from two regional models: POLCOM-ERSEM and ECOSMO (Wakelin et al. 2012a; Artioli et al. 2013, 2014). Although carbonate chemistry was also considered in MPIOM-HAMOCC-zoom (Gröger et al. 2013) and ECOHAM simulations (Alheit et al. 2012), no ocean acidification projections for future climate change have yet been published for these models. Only the ECOSMO model uses IPCC-AR5 ESM global forcing (Wakelin et al. 2012a; Pushpadas et al. 2015). All other downscaling studies of ocean biogeochemistry and all climate change impact scenarios for ocean acidification are based on global climate change scenarios from the IPCC AR4-generation models (Table 6.2). All regional scenarios lack land-ocean coupling, similar to regional hydrodynamic scenarios (see Annexes 2 and 3 and Sect. 6.3) and climate-driven changes in future river loads are neglected in most regional scenarios in accordance to ESM scenarios (AR4- and AR5-generation models; Regnier et al. 2013). Only for the ECOHAM downscaling scenario was an attempt made to scale river loads by changes in river runoff (Alheit et al. 2012). Different eutrophication scenarios were only considered in a couple of near-future studies undertaken within the MEECE project (Zavatarelli et al. 2013a, b). Production of organic carbon through photosynthesis (chemosynthesis is not considered here) is controlled by availability of light and nutrients, and is thus sensitive to climate change. A decrease in annual net primary production (netPP) in the northern North Sea was a consistent impact signal for all scenarios considering North Atlantic impacts and local atmospheric forcing (Holt et al. 2012, 2014, 2016; Wakelin et al. 2012a; Gröger et al. 2013; Pushpadas et al. 2015). The decreasing netPP could be largely attributed to a decrease in cross-shelf nutrient fluxes to the North Sea and a consequent fall in North Sea winter dissolved inorganic nitrogen (DIN; Holt et al. 2012, 2014, 2016; Gröger et al. 2013; Pushpadas et al. 2015). The decrease in nutrient fluxes originates largely from local oceanic stratification changes on the Northwest European Shelf and near the shelf break, but as sensitivity experiments by Holt et al. (2012, 2014) reveal the oceanic far field also contributes. Local stratification changes in the North Sea are less important. Projected decrease in netPP for the end of the century was moderate for the regional models ECOSMO (12 %) and POLCOMS-ERSEM (2 %) when forced by the IPSL-CM4.0 ESM (Wakelin et al. 2012a; Holt et al. 2014, 2016; Fig. 6.21). Projected changes in mean annual netPP from the ECOSMO-IPSL-CM4.0 scenario were significant and could be distinguished from climate-driven variability, although this was not the case for POLCOM-ERSEM results (Wakelin et al. 2012a). Pushpadas et al. (2015) projected greater decreases in netPP for regional model scenarios forced by the ESM MPIOM-HAMOCC (−19 %) and lower primary production decrease for the scenarios forced by BCM-HAMOCC (−2.3 %). Holt et al. (2012) reported that the North Sea is generally vulnerable to oceanic nutrient changes. However, this is compensated for by on-shelf processes and the actual sensitivity is less than expected. Holt et al. (2014) concluded that, like shelf seas in general, the North Sea is likely to be more robust and less affected by climate change than the global ocean, where the leading process of increasing permanent stratification significantly reduces netPP (e.g. Steinacher et al. 2010). The North Sea is well mixed for almost half the year, and local stratification changes are less important and potentially overridden by other processes (Holt et al. 2014). Strong tidal mixing and a substantial contribution of recycled production, based to a large extent on suspended particulate organic material advected onshore are major controls of ecosystem dynamics in the shallow southern North Sea (Holt et al. 2012). Holt et al. (2014) hypothesised that these properties may shelter the North Sea, similar to other shallow and tidally influenced shelf regions, from some direct impacts of climate change. Consistent with this hypothesis, the regional models ECOSMO and POLCOMS-ERSEM both projected the greatest decreases in production in the deeper northern North Sea and a moderate decrease or even an increase in production in the shallower southern North Sea in most of the scenarios (Holt et al. 2014, 2016; Pushpadas et al. 2015; Figs. 6.21 and 6.22). Comparing the two regional model scenarios forced by the same ESM (IPSL-CM4.0), shows that the pattern of projected change in netPP and the magnitude of local increases in the southern North Sea are very similar for both regional models, but that the modelled local decreases in other regions are much stronger in the ECOSMO model, which results in a six-fold larger projected decrease in overall netPP for the North Sea with the latter model (Wakelin et al. 2012a; Holt et al. 2014, 2016). A potential cause of this discrepancy is the temperature-dependent metabolic rates in ERSEM, which would speed up growth-and-mortality cycles in a warmer world, and their omission in ECOSMO (Daewel and Schrum 2013). However, according to an assessment by Holt et al. (2014, 2016) this can account for only a small fraction of the discrepancies, mostly along the coast. A more likely candidate is therefore the cross-shelf exchange of nutrients and thus on-shelf production, which is modelled differently by the POLCOMS-ERSEM and IPSL model (Holt et al. 2014). Differences are especially pronounced for the region south and west of Great Britain. These regions appeared to be the most important for nutrient supply to the entire North Sea system (Holt et al. 2012). The different spatial coverage of both regional models is therefore of key importance. ECOSMO, which is forced with boundary nutrients from the global model on the shelf, is more strongly coupled to the global model and its projected changes are more similar to the projected changes by the global model (Chust et al. 2014). In contrast, POLCOMS-ERSEM is forced by boundary conditions from the global model off-shelf and resolves cross-shelf exchange. Hence it can deviate more strongly from the global model and could develop its own regional dynamics. These findings support the hypothesis that the different cross-shelf dynamics in the regional and global model in the shelf break region is a likely cause for deviations in projected climate change impacts between the two regional models. The projected change in the Skagerrak region is also quite different in both regional models. A decrease in netPP is projected by ECOSMO and an increase by POLCOMS-ERSEM. The latter is probably biased by not resolving the Baltic Sea response and artificial boundary assumptions for POLCOMS-ERSEM. Steinacher et al. (2010) reported a drift in the IPSL-CM4.0 ESM A1B simulation. The degree to which the drift affects regional downscaling remains unclear and there has been no attempt to estimate or remove a potential regional drift in either the POLCOMS-ERSEM or the ECOSMO downscaling. The projected decrease in netPP from the MPIOM-HAMOCC-zoom model scenarios for the North Sea (Gröger et al. 2013) is 30 % and so substantially larger than estimates from the regional scenarios discussed above. Gröger et al. (2013) concluded that regional impacts on netPP are amplified in the North Sea relative to the global ocean and hypothesised that the shelf is more vulnerable than the open ocean, contradicting the findings and conclusions of Wakelin et al. (2012a), Holt et al. (2014) and Pushpadas et al. (2015). Possible reasons for opposite findings in the regional studies are different sensitivities of the cross-shelf exchange in the global and regional approach caused by different spatial resolution and sensitivity to the GCM bias and bias correction (as shown by Holt et al. 2014), and differences in the regional and global biogeochemical models. That the lower resolution in the MPIOM-HAMOCC zoom configuration (Gröger et al. 2013) compared to the regional models is a major reason for the different sensitivities seems unlikely, since the MPIOM-zoom resolution did not appear to be critical for the representation of hydrodynamics compared to high resolution regional models (not yet published). More likely factors are differences in the biogeochemical parameterisations and the forcing GCM. The regional multi-ESM ensemble study presented by Pushpadas et al. (2015) supported this view, given the large inter-model spread in North Sea projected changes in netPP, caused by the parent ESM (Fig. 6.22). From their six-member ensemble the most pronounced decrease in netPP was modelled by the MPIOM-HAMOCC A1B scenario, however, the projected decrease in the North Sea is weaker (19 %, exact numbers to be used with caution, due to differences in area) when using the regional ECOSMO model compared to the MPIOM-HAMOCC-zoom, which shows that there is also a large sensitivity to the biogeochemical parameterisations on the regional scale. Also, as discussed by Gröger et al. (2013), the global HAMOCC model lacks many processes considered relevant on the shelf, including temperature effects on mineralisation, resolution of the nitrogen cycle and recycled production, realistic benthic remineralisation and re-suspension of organic material. This limits performance of the model in the shallow North Sea and could affect the sensitivity of primary production to climate change. As a result, the North Sea decrease in netPP could be overestimated by the MPIOM-HAMOCC-zoom, which was also considered possible by Gröger et al. (2013). It is important to note that the correct sensitivity of the North Sea biogeochemistry to climate change is not yet clear, due to the lack of observations preventing an assessment of the different regional and global model approaches. Whether the above mentioned lacking biogeochemical processes are critical to the sensitivity of the regional biogeochemistry of the North Sea is also unknown and MPIOM-HAMOCC-zoom as presented by Gröger et al. (2013) was so far not compared to other biogeochemical models of the North Sea in detailed sensitivity studies. Studies for other seas (such as the Baltic Sea) suggest that even small differences in the parameterisation of biogeochemical processes, and not necessarily only the complexity of biogeochemical models may already be significantly affecting model sensitivity to changes in nutrient availability (Eilola et al. 2011). The ensemble mean projected change in primary production forced by ESMs scenarios (IPCC AR4- and AR5-generation models) and inter-model spread for both ensembles were compared by Pushpadas et al. (2015; Fig. 6.22). They found a stronger ensemble mean decrease in netPP for the RCP4.5 scenarios than the ensemble mean from the SRES A1B scenario, despite the modelled warming being less in the newer RCP4.5 scenarios. The inter-model spread in projected netPP decrease was significantly lower in most of the area for the RCP4.5 scenarios, with −2.3 to −19 % for the A1B-AR4 scenarios versus 2.5 to −13 % for the RCP4.5-AR5 scenarios. However, generalisation from this finding is premature and not supported by the small number of ensemble members (three) for the A1B and RCP4.5 scenarios, respectively. The projected decrease in netPP and its inter-model ranges in the North Sea are very similar to the projected global decrease and its inter-model range (Bopp et al. 2013). Holt et al. (2014; Fig. 6.23) showed that the different competing processes have contrasting and spatially structured impacts on primary production on the shelf. Their results demonstrated that the oceanic nutrient changes in the upper water layers due to changes in stratification and the consequent cross-shelf fluxes are the primary cause for projected on-shelf netPP decrease in the central and northern North Sea from the SRES A1B scenario forced by the IPSL-CM4.0 ESM. The increase in netPP in the shallow southern North Sea was attributed to changes in wind forcing and thermal forcing. Wind and thermal forcing contribute to faster on-shelf transport of particulate material and faster recycling of organic material due to increased temperature (Holt et al. 2014). In the central and northern North Sea modelled netPP changes were negative due to more stable thermal stratification, a signal that is weak in the central part and stronger towards the northern boundary and off the shelf. In the southern North Sea, netPP increased due to higher air temperature. In this region, the temperature impact on stratification is inconsequential and the temperature effect on biological recycling dominates. Averaged over the entire North Sea, the contributions from temperature increase leading to increases and decreases in netPP tend to cancel out, which is in accordance with results from perturbation experiments by Drinkwater et al. (2009) and Skogen et al. (2011). Wakelin et al. (2012a) used the ECOSMO model to assess variations in regional projections arising from the forcing GCM for the combined atmospheric drivers. From these simulations no consistent atmospheric driver signal was projected for the North Sea. Both increasing and decreasing netPP were projected and there is low spatial correlation between the different projections (Fig. 6.24), similar to results presented by Holt et al. (2014, 2016). Overall, the local amplitudes of change stemming from the atmospheric drivers remain in the O(10 %). Average changes for the whole North Sea are much lower and wide areas remain almost unchanged. Comparing the atmosphere-only (Wakelin et al. 2012a) and atmosphere-ocean scenarios forced by ocean boundary nutrients from ESMs (Pushpadas et al. 2015) it can be concluded that decrease in oceanic nutrients is the dominant process in these scenarios and that consideration of changes in oceanic nutrient conditions is critical for reliable projections of future climate impact on the North Sea biological system. Near-future scenarios performed with the NORWECOM and Delft3D-GEM/BLOOM models show minimal changes in near future netPP, using modelled chlorophyll as a proxy (Friocourt et al. 2012). However, potential effects of changes in top-down control on netPP are not addressed when using chlorophyll as a proxy and could be missed. Seasonal variation in average chlorophyll concentrations does not differ much between the control run and the future climate scenario in either model. Whereas the NORWECOM model shows a slight decrease in chlorophyll over most of the year, this is not the case for the Delft3D model. In the latter, the onset of the spring bloom, as indicated by chlorophyll, occurs earlier for the future climate scenario compared to the control run together with a slightly earlier decline in chlorophyll levels. In the NORWECOM model, the onset of the spring bloom is unchanged in the future scenario but, like the Delft3D model, shows a slightly earlier decline in autumn. Future changes in eutrophication in the North Sea as a consequence of climate change have been investigated through scenario simulations with NORWECOM for the end of the century (Eilola et al. 2013; Skogen et al. 2014). To assess eutrophication impacts in downscaling scenarios the OSPAR Commission Common Procedure was applied (OSPAR 2005), which distinguishes between parameters in four categories (see Almroth and Skogen 2010): the degree of nutrient enrichment (Cat. I); the direct effect of nutrient enrichment, plankton growth (Cat. II); the indirect effect of nutrient enrichment, increased oxygen consumption (Cat. III); and other possible effects of nutrient enrichment, such as changes in ecosystem structure (Cat. IV). Several eutrophication related parameters, such as winter DIN and dissolved inorganic phosphorous (DIP) and the DIN:DIP ratio, chlorophyll a, and oxygen can be easily explored with models and are used as indicators (in accordance with current management practices). Eilola et al. (2013) found a minor increase in winter nutrient levels for a future climate and projected a slight increase in phosphorus along the continental coast, while nitrogen is unchanged. A slight increase is also seen in summer chlorophyll levels in the German Bight and Kattegat, while the North Sea oxygen minimum is almost unchanged. Using these indicators, Skogen et al. (2014) concluded from one scenario that the overall eutrophication status of the North Sea would remain unchanged under a future climate. However, an increase in the river nutrient load caused by increased runoff, which has the potential to increase winter nutrient levels and eutrophication status near the coast (Zavatarelli et al. 2013a) was not considered in their assessment. The NORWECOM projection was forced by the same GCM as the ECOHAM (Alheit et al. 2012), but using different regional atmospheric, hydrodynamic and biogeochemical models. The projected nutrient levels from ECOHAM are higher near the coast, probably because increasing river loads have been considered in this simulation. A key weakness of both studies is the lack of consideration of North Atlantic nutrient changes, which other studies show have the potential to cause large changes in pre-bloom nutrient levels and thus overall netPP (Holt et al. 2012, 2014, 2016). Near-future change in productivity and nutrients from climate-driven and direct anthropogenic eutrophication were investigated by Zavatarelli et al. (2013b) with two model systems, the POLCOM-ERSEM and ECOSMO models and for two different eutrophication scenarios. These studies confirmed the dominant impact of climate control versus direct anthropogenic eutrophication control for the offshore North Sea system and the larger eutrophication impacts in the coastal zone hypothesised by Zavatarelli et al. (2013a). However, the short assessment period (only ten years) strongly limits the ability to distinguish climate change signals and changes arising from internal variability. The ecosystem models employed for regional downscaling are limited in terms of their potential to model changes in species composition, community structure and trophic coupling. They typically resolve plankton community structure by addressing a few functional groups such as diatoms, nitrogen-fixing bacteria and flagellates. However, this is a subjective concept and the few groups chosen are arbitrary. Also, fixed parameterisations are used for vital rates (e.g. growth rates, mortality rates), and are often used as a tuning parameter. As a result, these models have very limited potential to resolve changes in species composition, even at the base of the food web and projections are highly uncertain (Follows et al. 2007). Moreover, the models are truncated food-web models, which do not resolve coupling to higher trophic levels and the feedback inherent in this coupling (Fennel 2009). Holt et al. (2014) investigated the sensitivity of diatoms relative to the rest of the phytoplankton community using the POLCOMS-ERSEM model. They found that both functional groups are sensitive to the projected changes, but that the amplitude of the projected changes is significantly smaller for diatoms than for the other phytoplankton functional groups. The changes are largest during the spring bloom and in the southern North Sea, when an increase in production was modelled to be supported by an accelerated growth rate. The changes were positive for all periods in both groups, except for summer, when production decreased significantly for the non-diatom groups. Examining changes in the near future with the Delft3D-BLOOM/GEM model (four phytoplankton groups), Friocourt et al. (2012) found substantial differences in the average distribution of the different phytoplankton groups over the year, despite negligible changes in overall chlorophyll concentrations. The spring diatom bloom occurred slightly but consistently earlier in the future climate scenario. The general trend is for an increase in dinoflagellates and an earlier onset of growth for this group. In terms of factors limiting dinoflagellate growth (light-, nitrogen- and phosphorus-limitation), bloom probability and duration are higher for the future climate scenario than for the present day, irrespective of the type of growth limitation. The relative increase is largest for the nitrogen-limited type of dinoflagellates. Wakelin et al. (2012a), Chust et al. (2014) and Pushpadas et al. (2015) found trophic amplification of the climate impact on productivity in the North Sea, based on ECOSMO and POLCOMS-ERSEM downscaling (Fig. 6.25). The relative decrease in production for the second trophic level is stronger than for the first trophic level, a phenomenon which is also widely seen in downscaling studies for other regions and in the response from the forcing ESM (Chust et al. 2014). Rising atmospheric CO2 concentrations result in higher ocean uptake of CO2. This in turn is driving a decrease in ocean pH and thus an increase in ocean acidification (OA) (also known as ‘the other CO2 problem’). However, OA is a complex process and is also influenced by climatic and biogeochemical processes. Artioli et al. (2013, 2014) investigated climate-driven impacts on OA in the North Sea using the POLCOMS-ERSEM model forced by the IPSL-CM4.0 ESM. For the end of the century, they found a significant change in annual mean pH of the order of −0.27, which is consistent in magnitude to the projected change in the annual global mean pH. The major driver for this decrease in pH was clearly the increasing atmospheric CO2 concentration. The projected temperature rise had contrasting effects on OA in their downscaling experiment; both decreasing the solubility of CO2, which leads to increased outgassing and lower OA, and increasing dissociation constants, which supports OA. Another but more minor effect is the decrease in total alkalinity due to the projected freshening which reduces the buffering capacity of the system. As Artioli et al. (2013) discussed, this feedback stems from assuming a simple correlation between total alkalinity and salinity (Millero 1995). Uncertainty might therefore be large and the total-alkalinity feedback remains unclear. Biological processes were identified to be responsible for a strong modulation of the spatial and seasonal patterns of climate-driven impacts on OA, with average local variations of more than 0.4 in pH (Fig. 6.26). In highly productive areas and during the spring bloom less OA was projected. Acidification generally peaks in autumn and aragonite under-saturation was simulated in the present climate for bottom waters in the central North Sea in spring and summer, caused by community respiration and simultaneous stratification, which prohibits ventilation (Artioli et al. 2013, 2014). Artioli et al. (2014) projected an increase in the seasonal aragonite under-saturation in bottom waters in a future climate due to increased respiration in deep waters and benthic systems. The largest seasonal variations in projected pH change occurred in coastal areas; the projected local increase in netPP in this area may also have helped to reduce the projected OA increase by up to 0.1 according to projections by Artioli et al. (2013, 2014). However, uncertainty in the near-coastal projections for OA is large, since river runoff and loads have significant potential to override the OA changes and consistent scenarios and projections for river nutrients and total alkalinity loads are not available. The POLCOMS-ERSEM results are consistent with projections from the ECOSMO model using the same ESM forcing (Wakelin et al. 2012a). The ECOSMO downscaling reveals a decrease in mean North Sea pH from 8.09 to 7.87 (1980–1999 to 2080–2099; Fig. 6.27), indicating slightly weaker OA as projected by Artioli et al. (2013, 2014), and a continuation of the present almost linear trend of OA in the North Sea. The small differences in projected change in pH potentially arise from neglected seasonality in total alkalinity due to biological processes and total alkalinity changes in the ECOSMO study, as well as from different coupling sensitivity to the climate model for both models. Increasing research efforts in recent years have improved understanding of OA and raised evidence for the broad impacts of OA on the marine ecosystem (e.g. Riebesell et al. 2007; Gattuso et al. 2011). Two such impacts namely the supporting effect of OA on primary production (Riebesell and Tortell 2011) and the effect of OA on the nitrogen cycle (Gehlen et al. 2011) were studied by Artioli et al. (2013). While using a simplified parameterisation of increased growth rates for all phytoplankton functional groups, they found the potential effect of OA on primary production to be similar in magnitude to the climate-driven impact on primary production and to enhance spring production and decrease summer production. This supports a shift from flagellates to diatoms, a signal which was found to move up the trophic chain and support mesozooplankton over microzooplankton. Artioli et al. (2014) concluded that OA and climate change impacts on primary production could cancel out but could also amplify, and that regional hydrodynamics and productivity dynamics need to be taken into consideration. However, it should be mentioned that these are first attempts to model the OA impact on primary production and that a very simple parameterisation was applied to extrapolate available knowledge on a species level to the entire plankton community. This is very likely to be an oversimplification, which could strongly overestimate the potential OA effect on productivity as discussed by Artioli et al. (2013, 2014). The effect of OA on the nitrogen cycle was found to be small compared to the climate-driven impact on the nitrogen cycle via increased mineralisation due to higher temperatures (Artioli et al. 2013). 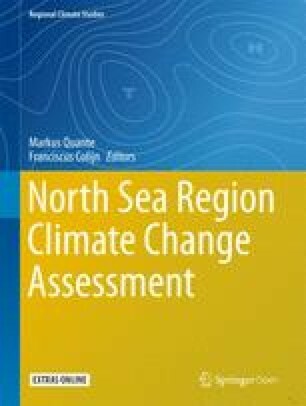 Increasing numbers of regional climate change scenario assessments became available for the North Sea and the new developments have contributed important understanding of regional processes mediating climate change impacts in the North Sea. Improved understanding of processes contributing to global sea level rise over the last decade has led to better regional projections of future changes in sea level. Better projections of future storm surges and waves are mainly due to better awareness of the factors driving change in the atmospheric storm track, and a better appreciation of the relative roles of long-term change and natural variability. Assessing climate-driven impacts on hydrography, circulation and biogeochemistry has benefited from new and advanced downscaling methods. Among these are the regional fully-coupled RCMs, initiated by the German KLIWAS project and physical-biological regional downscaling models, which were coupled with ESMs as part of the EU project MEECE. The large number of regional studies now available enables a critical review of current knowledge on climate change impacts in the North Sea region and allows the identification of challenges, robust changes, uncertainties and specific recommendations for future research. Coherent findings from the climate change impact studies reviewed in this chapter include overall increases in sea level and ocean temperature, a freshening of the North Sea, an increase in ocean acidification and a decrease in primary production. In terms of the drivers of these changes, the impact of natural variability on sea surface temperature and ocean acidification is less dominant compared to projected anthropogenic changes, and their projected future changes appear to be relatively consistent among the different downscaling scenarios. This is also evident when considering GCM simulated time-series of future annual average steric sea level. Unlike atmospheric quantities such as rainfall or temperature, the climate change signal exceeds the simulated natural variability for mean sea level even for future scenarios with a high degree of emissions mitigation. Thus a rise in future global sea level is a robust result, although the precise amount remains uncertain. A projected regional temperature increase towards the end of the century also appears to be a robust result from the multi-model ensemble projections reviewed in this chapter. However, the range in projected future temperature change depends on the choice of GCM and as the range in projected changes is of the order of the amplitude of the projected change itself, the magnitude of the change cannot therefore be considered robust. On smaller spatial scales a lower signal to noise ratio is typically expected. Projected regional patterns and seasonal modulation of temperature increase are variable and their future development is uncertain. The spatial patterns of sea level rise are also more diverse among the different regional projections (Pardaens et al. 2011a) but in the latest IPCC assessment some of the spread across normalised modelled sea level change patterns appears to have been eliminated. A general decrease in ocean pH was a consistent signal from two regional climate change projections of OA. Offshore inter-model differences in projected future ocean pH appear to be small compared to the magnitude of projected changes, which could be attributed to the strong impact of changes in atmospheric CO2 levels on ocean pH in comparison to other internal physical and biogeochemical effects. The projected increase in regional OA for the North Sea can thus be considered robust for offshore waters, despite the small number of studies available. In contrast, the importance of terrestrial impacts near the coast is increasing and the projections are adversely affected by the lack of terrestrial coupling and lack of information on river loads and total alkalinity changes. Wind changes have a strong impact, inter alia, on local sea level, storm surges, surface waves, primary production, circulation, advection of salt- and nutrient-rich water from the North Atlantic, mixing, stratification, and offshore transport of river plumes. The North Sea is located in the land-ocean transition zone of the Northwest European shelf, which is characterised by very high variability due to the alternating dominance of the maritime climate of the North Atlantic and the continental climate (e.g. Backhaus 1989; Hawkins and Sutton 2009). There are several modes of variability that are particularly important for the North Sea; the North Atlantic Oscillation (NAO), the Atlantic Multi-decadal Oscillation (AMO) and the Atlantic Meridional Mode (AMM, e.g. Grossmann and Klotzbach 2009). The large natural variability has a greater impact on the local North Sea wind field than potential anthropogenic-induced trends, and strong natural climate variability from annual to multi-decadal scales (e.g. Arguez et al. 2009) is a particular challenge when developing projections of climate change in the North Sea. Regional projections for changes in wind in existing scenario simulations are not robust for the North Sea (e.g. Lowe et al. 2009; see also Chap. 5), with many GCMs still unable to accurately capture features such as the placing and timing of atmospheric pressure systems in the UK region (IPCC 2013). The long-term climate trends are superimposed on the natural modes of variability and distinguishing between the two in order to identify the anthropogenic climate change signal is one of the ‘grand challenges’ of climate change impact studies in marine regions. This is of particular relevance for the North Sea region where reliable predictions concerning strongly wind-influenced characteristics such as local sea level, storm surges, surface waves and thermocline depth are still impossible. Substantial multi-decadal variability in projected climate change impacts was identified from atmospheric and sea level studies (e.g. Gaslikova et al. 2013). These multi-decadal variations bias projected changes estimated for 20- or 30-year time slices. Whether this is also relevant for ocean hydrodynamics and biogeochemistry has so far not been addressed. However, variability in wind fields appears a strong driver in hydrodynamic and biogeochemical changes in the North Sea (Skogen et al. 2011; Holt et al. 2014, 2016) and substantial multi-decadal variations are also to be expected for hydrodynamics and biogeochemistry (Daewel and Schrum, 2013). A common regional finding for those scenarios considering future variations in oceanic nutrient conditions is a decrease in future levels of primary production (which are not always statistically significant). However, the projected decrease varies widely (from −2 to −30 %) depending on the driving ESM and the regional model used (Gröger et al. 2013; Holt et al. 2014; Pushpadas et al., 2015). Projections of future regional primary production are therefore less robust than for sea level, temperature and OA, which was also concluded by Bopp et al. (2013) for changes in global primary production projected by recent ESMs. Uncertainties in regional projections from multi-model ensembles are still large for offshore nutrient and salt fluxes and the consequent changes in netPP. Local atmospheric impacts on netPP remain dominated by natural variability and a common response in scenario simulations for lower trophic level dynamics was hardly identified for atmospheric drivers. Moreover, extending the regional models into the Baltic Sea and across the shelf break appears to be critical for the North Sea. The downscaling studies of Holt et al. (2012, 2014, 2016), Wakelin et al. (2012a), Gröger et al. (2013) and Bülow et al. (2014), showed the projected change in cross-shelf exchange probably depends on model resolution and is critically influenced by GCM biases and by the bias correction strategies used in the GCM and regional ocean climate models. Close to the shelf, the boundary values from ESMs are impaired by a lack of consistent terrestrial coupling for nutrient loads (Regnier et al. 2013) and simplified parameterisation of physics and biogeochemical cycling in some ESMs (such as unconsidered re-suspension and tidal mixing). The reliability of the near shelf and near coastal boundary conditions from ESMs is therefore unclear, and more research is needed to improve understanding of land-ocean coupling and the regional impacts and feedbacks to the global scale. Another source of uncertainty is regional atmosphere-ocean coupling and the advantages and disadvantages of using coupled atmosphere-ocean downscaling versus uncoupled regional atmospheric models to force regional ocean models. The lack of consideration given to terrestrial climate change impacts and their coupling to the ocean through runoff and terrestrial carbon and nutrient loads is a major issue. Projecting terrestrial impacts on salinity and especially on nutrients, carbon chemistry and alkalinity is a challenge at both the global and regional scale. Consideration of terrestrial impacts is critical for a shelf sea like the North Sea and improved understanding of the coupled dynamics in the land-ocean transition zone is essential. Many downscaling studies for the North Sea assume that runoff from the catchment area and freshwater outflow from the Baltic Sea will not change under a future climate (e.g. Wakelin et al. 2012a). Only the MPIOM-REMO simulation (see Bülow et al. 2014) closes the water cycle, although a freshwater flux-correction is also used here at the global scale (Sein et al. 2015), which could introduce artificial sources and sinks and bias the projected changes to an unknown degree. To date, no attempt has been made to include changes in terrestrial nutrient loads or alkalinity at the regional scale, nor is this standard for ESMs (Regnier et al. 2013). Although the impact of changes in runoff and river loads and in Baltic Sea outflow properties is probably restricted to the southern coastal North Sea and the Skagerrak, respectively, a more consistent approach is needed to address the water and nutrient budget of the North Sea, one which should consider the entire land-ocean continuum. A new hydrological model, HYPE (HYdrological Predictions for the Environment; Lindström et al. 2010; Arheimer et al. 2012), was recently developed to calculate river flow and river-borne nutrient loads from all European catchment areas; this is known as E-HYPE. In the future, scenario simulations using HYPE should generate more consistent changes in water and nutrient budgets. But despite these recent efforts, the uncertainties in runoff for the end of the 21st century will still be considerable due to precipitation biases in regional atmospheric models, as illustrated by Donnelly et al. (2014) for the Baltic Sea. Projections of nutrient loads are even more uncertain than projections of river flow due to unknown future land use and socio-economic scenarios (Arheimer et al. 2012). Plus, the carbon cycle and carbon loads are still not considered in the present version of HYPE and coupled land-ocean carbon scenarios remain for future work. Other relevant factors include biogeochemical parameterisations, which have substantial impacts on structuring the ecosystem. For the North Sea system, sediment-water exchange and its parameterisation are particularly important. Further limitations are inherent in present-day regional biogeochemistry models. Changes in plankton community structure (e.g. Follows et al. 2007) and consistent trophic coupling also including higher trophic levels (e.g. Fennel 2009) are not yet incorporated and current models are too simple to provide reliable estimates of changes in community structure or trophic coupling. To date, they are only able to provide first indications of climate change impacts on trophic controls and community structure (e.g. Chust et al. 2014; Holt et al. 2014). Projecting future OA impacts on the regional scale requires better understanding of OA impacts on productivity, which could affect first-order impacts from changes in atmospheric CO2 levels (Artioli et al. 2013, 2014). Regardless of the specific methods employed, the downscaled simulations and regional studies are ultimately affected by the driving GCM or ESM. Despite improvements (e.g. Scaife et al. 2010), the latest generation of GCMs and ESMs still has significant biases and the spread in projected global warming among GCMs has not changed from IPCC AR4 to AR5 (e.g. Knutti and Sedláček 2012). Moreover, additional uncertainties arise from the downscaling methods and regional models used (e.g. Holt et al. 2014). From the simulations presented in this chapter it is clear that identifying best practice in climate downscaling is far from trivial and not yet achieved. A range of different approaches is currently used, each with advantages and disadvantages. A review of the literature shows that choice of regional model is not critical for the projected mean change, but is crucial for the projected spatial and seasonal patterns of regional climate change impacts. Regional models are sensitive to climate model biases and bias corrections are necessary for many applications, such as in modelling seasonal cycles of stratification and biological productivity. But bias correction also affects the sensitivity of regional systems to climate change impacts and might shift a critical change in one variable to a non-critical range and vice versa (Holt et al. 2014). Future work is required on the effects of global and regional model bias on regional dynamics and sensitivities to climate change impacts. While models and observations have long been used together for validation, bias correction and re-analysis there is a movement in general circulation modelling and earth system science towards the use of observations as a constraint on the future change projected by climate models (e.g. Murphy et al. 2004; Stott and Kettleborough 2002; Cox et al. 2013). In some cases (e.g. Stott and Kettleborough 2002), the approach is closely related to optimal detection of past climate change and uses the model’s ability to simulate past change in order to derive a distribution of signal weights that are assumed to apply in the future. In other approaches (e.g. Murphy et al. 2004), different model versions, using a range of different parameterisations, are used to simulate the future but the distribution of possible future scenarios is weighted according to each model’s ability to simulate recent climatology. While these methods are still evolving they present an exciting opportunity for improving the projection of North Sea climate change. First, the methods could allow a weighting of the boundary conditions to regional simulations. Later they might also be applied directly to regional simulations. Considerable further work is required to understand the relevant constraints and optimum statistical framework for applying them. The result could be a narrowing of the uncertainty range of future projections as the observed signal of climate change becomes ever stronger. Regional climate change impact assessment in the coastal area requires a greater degree of accuracy and more detailed process consideration than is currently available from GCMs and ESMs. GCM resolution is constantly improving, but so is resolution at the regional scale and the demand for detailed knowledge is expanding. Local planning in relation to climate change impacts might in future require unstructured grids or further local downscaling, as shown by Gräwe and Burchard (2012) for the western Baltic Sea or Zhang et al. (2015) for the North Sea and Baltic Sea. Combined assessment of climatic and direct human impacts such as eutrophication, fisheries, offshore construction, mining and dredging is increasingly required. Downscaling methods are therefore as necessary now as in the future and coupling regional downscaling models to down-stream impact models (such as for inundation or biological production at higher trophic levels; e.g. Daewel et al. 2008) is becoming increasingly important. Regional and seasonal patterns are very important for down-stream impact models and the application of such models requires the identification of robust patterns and estimates of uncertainty, making ensemble simulations, including larger sets of GCMs and regional models mandatory for the North Sea. Comparing results from different models to identify the presence or absence of robust change requires, as a minimum, harmonisation of experiment design, along the lines of the Coupled Model Intercomparison Project (CMIP, http://cmip-pcmdi.llnl.gov), to set standards that endure beyond the length of individual projects. This in turn requires a greater degree of organisation and resources in regional downscaling for the ocean. Bouttes N, Gregory JM, Kuhlbrodt T, Suzuki T (2012) The effect of windstress change on future sea level change in the Southern Ocean. Geophys Res Lett 39: L23602, doi: 10.1029/2012GL054207.